The Emerald Gemstone is the Gemstone of Mercury as per Vedic Astrology. Mercury is the planet that controls speech, communication, intellect, business and finance. In this age Mercury is also a very important planet as it controls the internet, information and technology, entrepreneurship and start ups. 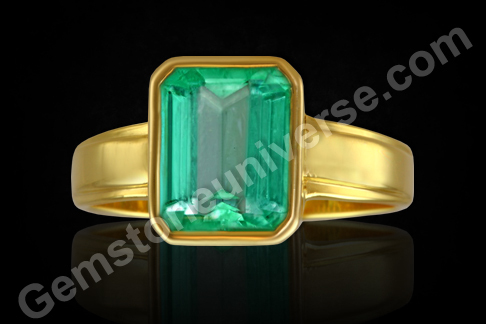 The Emerald Gemstone is a green coloured Gemstone of the beryl family. Most of the traded emeralds come from Colombia and Zambia. Mercury is an intimate friend of the planets Saturn and Venus. In the ascendants ruled by Saturn, Venus and Mercury itself, this planet plays a key role and Emerald can bring many benefits to the individuals if it is posited in the key houses as per Vedic Astrology. Featured today is an exquisite Colombian Emerald set in 22 K Gold Ring. When Judging Emerald Clarity it is good to know that Emeralds are always included. 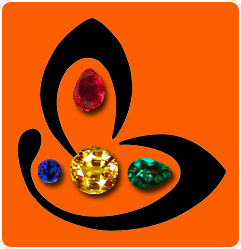 However in such a large crystal to have 90% and above clarity puts it in the league Premium Jewellery Grade Gemstones.The deep color, perfection of cut and lack of any flaws as per sacred texts make it a true Jyotish Gemstone capable of giving remarkable transformation that only Jyotish Gemstones are capable of.To view this Gemstone before it was set please click here.